Materials: 100% recycled gold mixed content 22ct, 18ct, 9ct. 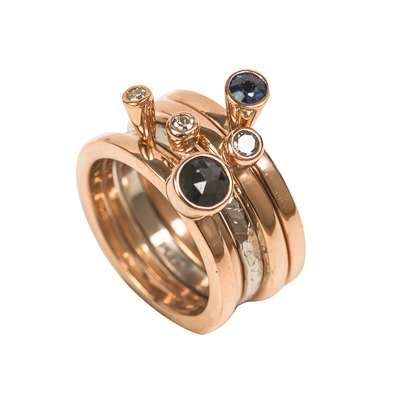 Gems: Round brilliant cut diamonds and sapphires supplied by client and rose cut black diamond sourced. The client came to me with multiple inherited pieces of jewellery, none of which was being worn. They wanted to use some or all of the stones and gold in the design of the engagement/wedding ring. It was decided that the best use of all the gold and stones they had would be to make stacking rings. She loved the idea of flexibility with the different rings. As discussions progressed it was decided that she would like 5 rings. I them mixed the metals and melted the gold together to achieve a beautiful rich colour of metal and set about making up the rings. In doing so keeping the sentiment attached to the original pieces.